Whether you undertake a lot of sewing projects for personal or professional purposes, the Toyota SL3335 Overlocker machine would make a nice addition to your collection of sewing tools. This machine not only creates beautiful finished edges but also offers a variety of stitches and a few useful features that make sewing fun, easy, and fast. If you’re in the market for a new Overlocker, then it’s important to weigh your options carefully. One way to make an informed decision is by comparing what different models have to offer in terms of features. With that in mind, the following Toyota SL3335 Overlocker review offers more information on what to expect should you decide to settle for this model. The great thing about the Toyota SL3335 is that it comes fully threaded with 4 free cones of white thread. Therefore, you can begin sewing as soon as you take the overlocker out of the box. For first time users, this is a great feature as it prepares you for the tricky part of threading an overlocker by showing you how a threaded unit should look like. This coupled with the threading diagram on the overlocker and threading guide help make it easy to thread your new Toyota SL3335. What’s more, you can always refer to the included instruction manual when in doubt. The Toyota SL3335 is a 2, 3, 4 overlocker. This essentially means you can use a 4, 3, or 2-thread setup when sewing. Having multiple spools of thread to sew with opens you up to a wide range of possibilities. For instance, you can easily tackle thick materials with a 4-thread and 2-needle setup or achieve that perfect, small and neat finish on fine materials with a 3-thread and 1-needle setup. With this much freedom in adjusting the various controls of the overlocker, you’ll be able to give all sewing projects a beautiful and professional looking finish. Another great aspect about the adjustable controls and dials is that they are clearly labeled, making it easier for beginners to learn the basic workings of the overlocker. Aside from the standard presser foot that comes with the Toyota SL3335, there’s a good range of optional accessory feet available on the market that can be used on the machine. These include everything from Blind Hem and Elastic Feet to Gathering and Piping attachments. By investing in these optional accessories, you’ll be able to expand the machine’s sewing capabilities. Although not a make-or-break feature, any individual who has ever worked with an overlocker or sewing machine will agree that illumination of the work area by an in-built source of light is always welcome. This is because the light delivers a good view of the work area thus reducing chances of making damaging or difficult-to-reverse sewing mistakes and also allows you to work in a poorly lit room should the situation demand it. With the Toyota SL3335, you’ll be able to enjoy these 2 benefits as the overlocker’s design includes a built-in sewing light that delivers a good amount of lighting. The Toyota SL3335 overlocker measures 300 x 230 x 290 mm. Comes with a detailed manual which features clear instructions that help make it easy to use the overlocker. The instruction manual explains what stitch lengths and thread tension settings work on different fabrics. Has a carry handle that enables easy transportation. Reduces the amount of time needed to complete your sewing projects by allowing you to sew, neaten, and trim away excess seam allowance in one easy operation. Converts from over locking to roll hemming at the flick of a switch. Other models require you to change the foot and plate, prolongs the hemming process. Allows for the use of 2 threads which is quite uncommon among overlockers in the affordable price range. Sews fast and has a maximum speed of 1500spm. Does not make a lot of noise during operation. Includes a seam tape guide in the standard presser foot. Comes with a 15-year warranty on parts and labour. Consumer ratings: The Toyota SL3335 overlocker has made a lot of sewing enthusiasts very happy buyers. The overlocker has been used by both first-time users as well as experienced sewers who find the machine to be efficient, quiet, versatile, and great at copping with different fabric types. Several users have also commented that the machine is easy to thread and delivers excellent stitch quality. All in all, most users find the Toyota SL3335 a pleasure to work with, which goes to show the level of quality that you should expect from this unit. So, who should buy the Toyota SL3335 overlocker? Well, whether to buy this unit or pass it on for something else ultimately depends on your budget and the feature set you’re looking for. Based on the features that this model provides, it’s honestly a great pick for anyone in need of a 4-thread Overlocker with decorative hemming capability. For an affordable overlocker, the Toyota SL3335 has a lot more to offer. It’s easy to use and delivers versatile operation that allows you to undertake a wide range of sewing projects. The fact that this overlocker can also be adjusted to suit different sewing tasks is another bonus worth mentioning. Best of all, the Toyota SL3335 has all the practical features you would want in an overlocker (i.e. 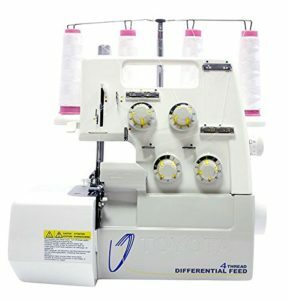 built-in roll hem, several stitch options, adjustable stitch length, differential feed, variety in sewing setup, and much more.). Therefore, the Toyota SL3335 delivers good value for your money and you won’t be disappointed with your purchase.